Display interface Windows 8 ~ " World Information "
SAN FRANCISCO - Microsoft is fulfilling its promise to demonstrate the operating system Windows 8. Then what kind of display Friday's OS software giant? By Microsoft, the user interface of Windows 8 is to cover the gap between conventional PC users, with user-based tablet that much more on the touch screen. The company is clearly aiming to create a new OS into a friendly touch screen, by presenting a large button on each application. 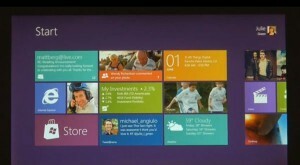 It also userinterface Windows 8, also featuring the Metro design used on Windows Phone. The user interface displays the hours and days, including the iconic power management and ease of access to applications. Unfortunately no further details about Windows 8, which indeed is merely a demo video. Including when the final version will be released soon, although there will likely be presented in 2012 by Microsoft.